Diane and John from Chicago were kind enough to send us pictures of their Estates TV lift cabinet in their beautiful windy city home. The Estates TV lift cabinet fits beautifully into the alcove adjacent to their fireplace. The traditional look and African mahogany stain of the Estates blends in nicely with the character of their home. “We absolutely love our lift cabinet. Our friends are all amazed at how it works. It’s fun to put on demonstrations of the mechanism. It’s our best party trick! And the case is beautiful. People have asked me if it is an antique, as it has such a distinctive look…not at all cookie-cutter. We are thrilled with it. The price was good and it came in less than a week.” – John and Diane. If you have pictures of your TV lift cabinet that you would like to share with us, please send to [email protected]. We would like to hear from you and see how you have incorporated your TV lift cabinet into your home décor. 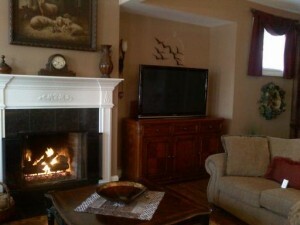 Thank you, John and Diane for your glowing review and beautiful home pictures. We loved them!